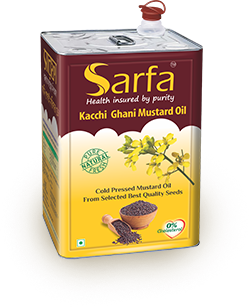 Sarfa 15 Kg Mustard Oil units come in solid tin containers, thus preventing leakage and spills. Mustard oil has an edge over other oils due to the optimum ratio of omega-3 and omega-6 fatty acids and low content of saturated fats. 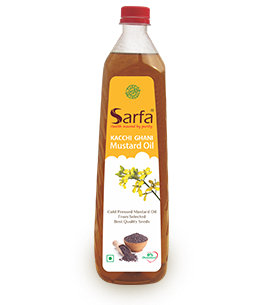 Sarfa 5 ltr Mustard Oil units come in easy to use plastic jars, which are hardy yet lightweight. Mustard oil has an edge over other oils due to the optimum ratio of omega-3 and omega-6 fatty acids and low content of saturated fats. 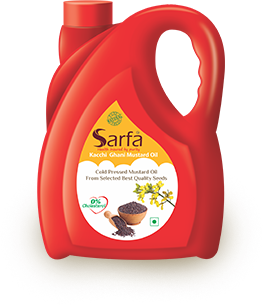 Sarfa 1 ltr Mustard Oil units come in food grade plastic bottles. Mustard oil has an edge over other oils due to the optimum ratio of omega-3 and omega-6 fatty acids and low content of saturated fats. 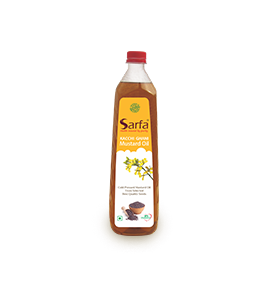 Sarfa 500Ml Mustard Oil units come in food grade plastic bottles. Mustard oil has an edge over other oils due to the optimum ratio of omega-3 and omega-6 fatty acids and low content of saturated fats.